Government of India, under the shipping and transport ministry, has taken up the Sethu Samudram project, with the intention of reducing travel distance and time for the ships, which at present are going round Sri lanka. A shortcut to connect east and west coast of India was envisaged, by constructing a shipping channel that would connect Palk Bay with Gulf of Mannar. Various proposals were considered and finally the ministry decided on a particular route which passes through Adam's bridge. Unfortunately, this bridge gets destroyed, albeit by a short distance, on the successful completion of the project. This mutilation of the Adam's bridge (Ram Sethu) has evoked loud protests and opposition. Ram Sethu is held sacred by millions and millions in the country. Many technical and practical difficulties have also been encountered. The matter is now before the Supreme court. Alternatives to the above plan have been welcomed, a plan which would be more acceptable under the given scenario. Search for a suitable alternative has begun. Government proposed alignment No.6 of Sethu Samudram project is riddled with controversies. Apart from destruction of Ram Sethu it is also flawed on technical and environmental aspects. It is dangerously nearer the international border exposing it to terrorists and people hostile to our country. Security and Safety is in serious jeopardy. It affects the livelihood of thousands of fishermen. It is also economically unsound . So, there is no virtue in persuing it. To qualify for consideration, any route should address itself to the following major issues, and help resolve them satisfactorily. 1. Ram Sethu should not be touched. Its safety and sanctity are to be maintained. 2. The route should not adversely affect the ecobiosphere. It should have least impact on the marine life, and the coral reefs . 3. It should not expose the southern part of the country to the ravages of cyclone, floods and Tsunami. 4. Thorium and other precious minerals should be protected. They should not get washed away. 5. It should not be open to outside influences. It should not put the security of nation to peril. 7. The tranquility and calmness of Gulf of Mannar should be maintained. 8. 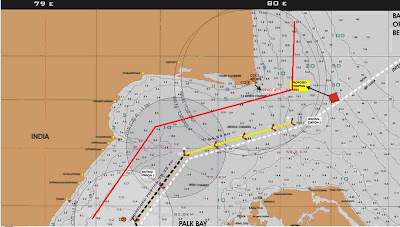 It should be safe and comfortable for vessels plying in the route. It is a very difficult proposition to get a route which is going to answer all the above conditions completely satisfactorily. Thus, a selection has to be made of a route which is least offensive. In the event of the absence of any such alternative, it is best to drop the very idea of the S.S. Project itself. In an effort to find a suitable solution to the problem an attempt has been made here and an alternative has been suggested The existing project.has been overhauled and an entirely new, expanded version has been presented here for consideration. a) A navigable canal connecting the two Seas at Palk Bay and Gulf of Mannar. b) Creation of new Defence outposts along the International border in the Indian Ocean. c) Protective measures to Tsunami / cyclone prone areas of East Coat of India. 1. It is 500m wide and of suitable depth convenient for 12.8m draught vessels to ply. 2. It runs along the coastal region – nearer to coast and away from International border. 3. The canal includes a land channel near Dhanushkodi. 4. There is a ‘lock’ system in the land channel portion – gates both at entry and exit points. 5. It comprises of trenches dug on either side of the banks all along the Dredged portion of the canal. Trenches are of 20m wide and 2 m deeper under the sea bed. The banks are sloppy to check mud slides. 6. It comprises of trenches across the canal, 100m wide and 3 m deeper under sea bed at various places enroute and especially at the mouth (entry and exit points) of the land channel. 7. The dredging is done in a controlled way at Sensitive areas especially near coral reef areas and marine park in the Gulf of Mannar. 8. The Land channel has a Cantilever Bridge to give access to Dhanushkodi. The route is away from the International border. It is oriented to be as near the Indian Coast as practicable. The route is some what parallel to that of the Alignment No.6 of SSCP or International Boundary. From Point Calimere upto land near Dhanushkodi, the canal would be roughly 25 km away from I.B. The nearest points to it being Point Calimere and Dhanushkodi. The line cannot be pushed further as it would involve greater dredging. It is desired to be as away from Point Calimere as possible because of wild life and bird sanctuary there and also of the surrounding Vedaranyam Swamp and Muthupet Mangrove area. It has to be away from Shingle Island to avoid disturbing National Marine Park and Coral reefs. The route cuts the land near Dhanushkodi and there will be land channel of 2-3 km here. This channel houses controls. The land channel is worked out to act as a “Lock” to check stream speed and to protect the down region from Floods. The curvature and bends in the canal and multiple changes in the direction slow down radically the speed of the waves during floods / cyclones. The strain on vessels criuising the curves is inevitable. One of the major disadvantage is that the dredgable length of the canal increases much. Anyway for a good length, dredging operation would be minimal because of the depth already prevailing in the route. The sketch of the new route is given below. 1. The project acts as a catalyst for increasing the trade and industrial activity in the region. 2. The wider canal enables quicken movement of vessels, thus saves on time. 3. Larger capacity vessels could use the route. 4. Direct Sea link is established between the shores of Tamil Nadu. 5. Canal is nearer to land. As such there will be further savings in distance and time of travel. 6. Deeper canal and trenches keep the canal silt free and smooth movement of vessels is assured. 7. Vast area is made available to the fisherman in the sea. The canal being shifted to one end, there will be unobstructive movement for fishing boats. 8. The fishermen will now have access to both the Seas. Unhindered movement between Palk Bay and Gulf of Mannar. 9. It will be away from the sinister outside agencies reach and influence. 10. Ram Setu remains undamaged. It wont be touched. The land channel and the lock system helps in reducing the disturbance and the mixing of the Water of the two Seas. b) Marine Life goes on uninterrupted. c) The mineral deposits like thorium etc. wont get washed away. 12. Effect of Tsunami / cyclone fury is reduced. 13. Controlled dredging would see no flight of fish, no damage to coral reefs, algae and marine life. Very little turbidity ensures sufficient oxygen and sunlight to the organizm. They won’t get suffocated. The noise pollution also is reduced. Flight of fish gets stopped. Anyway dredging is a temporary measure and normalcy would soon be restored. 14. Cantilever Bridge would provide link to men and industry in the Dhanushkodi area. There won’t be any rehabilitation problem Ferry System across banks could also be provided (as at Vivekananda Rock Memorial, Kanyakumari). 15. The Dredged material is gainfully utilized. What was otherwise a liability is now converted into an asset. The controlled dredging produces good quality material for use. 16. The dredged material is used up in creating Islands along the International border within Indian territorial waters. The Dumping grounds would be converted as Defence outposts. Four such outposts are recommended especially near the present (Alighment No.6) waiting stations Nos. 1 ,2 ,3 and 5. These outposts monitor the area and keep a vigilant eye on the movement and activities of LTTE, Piracy, Terrorists etc. These outposts would help further the safety and security of the country’s Southern Border. The recently created Naval base at Mandapam would supervise the canal and outposts. 17. Dhanushkodi could be improved as a pilgrim centre and scope to promote tourism is there. 18. The out posts at waiting station No.3 (of SSCP Alighment No.6) would also act as a barrier for the land channel against floods. 19. Barriers could be constructed infront of ports and coastal region which are very prone to Tsunami / Cyclone damages. The dredged material is utilized in these places. Artificial Islands come up high above Sea level, this will tame down the fury of waves. Cultivation of vegetation further strengthens it. 21. Maintenance dredging becomes easy and less costly. 22. The canal being nearer to Indian Coast and far away from international borders, the threat from Sea mines attack is much reduced. 23. Equipping the canal with laser guidance system control etc. would assist pilots cruise the vessels safely and quickly. 24. The wider canal helps in quicker transit of vessel. 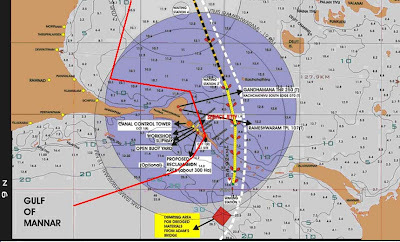 This would directly influence the waiting time, Bunkering facilities and VTMS space, and Pilot services. 25. The travel distance and time is further reduced because of the nearess of the route to the coast. 26. The canal is not straight . It takes a slanting route. It also takes two curves. Thus the direction of the stream changes continuously. This helps is slowing down the stream speed during cyclones etc. 27. Any accidental grounding of a ship in the canal will not cause obstruction and chocking because of the expanded width of the canal. 1. Below Ram Setu and above waiting station 1. 2. Above Ram Setu and Dhanushkodi and below waiting Station 3. Both the above sites are in the dredgable area of SSCP alignment No.6. 3. Above waiting station 5 at the start of dredgable portion of the Route at E.
4. At E4 in the route. The selection of and the size of the outposts depend on the volume of the material available and the importance of the site from Security angle. 1. Dredging affects ecobiosphere. So it necessitates to do it in a controlled way. This adds to the cost. 2. The freedom to choose the route is curtailed. Probably the SSCP No.6 alignment was chosen mainly because it involved less dredging operation. The route (No.6) chosen was of maximum depth available at the area and this forced the selection. Unfortunately, it happened to be nearer the international border. 3. The disposal of the dredged materials is a headache. Transportation to longer distance means extra cost. Dumping nearby would make it easily get washed off into surrounding area, causing much pollution and turbidity. The new route attempts to answer all the above constraints. 1. The dredging is done in a controlled way, in enclosures, to avoid polluting the surrounding. 2. The cost factor is ignored by making the dredging operation an integral part (subunit) of a bigger comprehensive project. Dredging is done in water tight enclosures. Sturdy enclosures which can withstand the Hydrostatic pressure of the Sea around it, is constructed in the area to be dredged. The enclosure height is above the sea to ward off waves and the entering of water from outside into the enclosure. It is sealed at the bottom to prevent seeping of water. Water inside the enclosure is pumped out. The Sea bed gets exposed. Digging / Dredging is done to the required depth. The operation becomes easy, as the dredged material is solid or semisolid. The debri is shifted simultaneously to its destination. If rock is encountered, it would be easier to break and remove. This would also measure the depth dredged accurately for computation and billing. 1. The clear water is pumped out first ,so no turbidity . 2. The debri will not cause turbidity as it is solid / semi solid. 3. It is easy and convenient to handle and shift the debri. 4. The surrounding water in the Sea ,does not get turbid or polluted, during dredging operation. 5. The dredging operation becomes visible and measurable accurately. 6. The operation gets finished quickly. 7. The dismantled enclosure could be reused elsewhere. 8. Operation being small, the disturbance is not severe, including that of noise pollution. 9. It is time saving. Solid dredged material would be easy to handle and use at its destined site. a) As the new route is nearer the coast and runs in shallow waters and is away from the field of activity of fishermen, no encroachment into their normal activity will be there. In fact they will have more area under their sway now. b) The Dredging in this area would not affect fishermen community. Also dredging being done in a controlled way, there is less disturbance to marine life. c) The surrounding Sea water will not become turbid, it is not threatening to the marine life. d) Link to Dhanushkodi is maintained. The land canal runs in an uninhabitated area. The occupation or residence of locals is not disturbed. e) The fear that, Palk Bay area water gets mixed with Gulf of Manner area water will not be there. With the land channel acting as a ‘Locke’ the danger from floods rushing into calm waters of GOM and driving away fish species is much reduced. And also with the constraints removed, including cost escalation due to opting for a consolidated bigger project. Thus it gets easier now to consider the proposals for improvement measures in the region, especially the marine wealth augmentation which would be helping in turn the fisher folk. With the movement of ships being shifted towards Indian coast in both the regions, the disturbances to fish due to them gets lessened. Sulphur Dioxide is the main pollutant. It has to be removed from exhaust gases emitted by ships to avoid pollution of the environment. Gas scrubbers using calcium carbonate etc. to remove the Sulphur Dioxide are to be fixed. Calcium Carbonate is easier to handle and is cheap. The sludge could be dumped to the sea. Proper care in needed for any possible oil spills. The modialities and technical details are better left to the considerations of experts in the field. Constant inspection is needed of the route, the trenches and specifically of the Locks in the land channel. An attempt has been made here to find an alternate Route to the Setu Samudram canal project. It is hoped that this route is going to meet the requirements and be qualified enough for acceptance. This new route together with controlled dredging operation and flood blocking mechanisms, it would be found useful for smooth functioning of the canal. Various precautionary measures to deal with national security aspect, protection of marine life and reefs are discussed in detail. The waste dredged material could be gainfully used forcreating National Security Out Posts and for Cyclone protective neasures.A separate project has been recommended here. The supervision of entire dredging activity would come under the umbrella of the new project. Thus the canal project would be more viable and there is plenty of scope for expansion. Hope this proposal would find favour of implementation with necessary improvements.